When you hear the word diet, the last thing that probably comes to mind is dessert. But on the keto diet, you can have your cake and eat it too. As long as it’s low carb cake! The keto diet is a low carb, high fat diet that is praised for its ability to help its participants drop excess pounds. Not only is it commended for its weight loss benefits, it also makes your mind and body healthier all around, reducing inflammation and bad cholesterol, boosting cognitive function, and improving good cholesterol. And if you think that means you need to live without keto desserts, read on! The goal of the keto diet is to get your body into the state of ketosis. Ketosis occurs when your body can no longer find glucose from carbohydrate food and must find an alternative source of fuel: fat. Once your body starts burning fat, it produces ketones, and once ketone levels raise to a certain point in your blood, you enter ketosis, which results in weight loss. To sum it up, the keto diet turns your body into a fat burning machine. There are certain food groups that are typically best to eat on the keto diet in order to stay within the guidelines of the diet. Fats and Oils. Fats and oils are an important part of the keto diet, but it’s important you know the good fats to eat and don’t get confused about what to consume. You want to get your fats and oils from natural sources such as meats and nuts. The fats you can eat on the keto diets are: saturated fats, monounsaturated fats, polyunsaturated fats, and naturally-occurring trans fats. Protein. You don’t want to go overboard with protein while you’re on the keto diet. Too much protein can lead to lower levels of ketone production and increased production of glucose. When you eat meat, try your best to only eat pasture-raised and grass-fed meat, and as for fish, the fattier, the better. You can eat poultry, shellfish, beef, pork, bacon, sausage, lamb, turkey, veal, goat, eggs and nut butters. Fruit and Vegetables. Be careful with fruits and veggies on the keto diet. Although they’re known as “healthy”, many fruits are vegetables are actually very high in sugar and carbs. You’ll mostly want to stick to dark, leafy greens (spinach, kale, broccoli) when it comes to vegetables, and low carb fruits like rhubarb, avocado, tomatoes and starfruit. Dairy. Most dairy can be consumed on the keto diet, but try to keep your consumption of dairy to a moderate level. Raw and organic dairy products typically have fewer carbs than processed dairy, so buy those if you can. You can eat heavy whipping cream, Greek yogurt, cottage cheese, cream cheese, sour cream, mozzarella, brie, parmesan, and other hard and soft cheeses. Make sure to go with full fat products. Nuts and Seeds. Not all nuts should be eaten on the keto diet. Some nuts, such as pistachios and cashews are very high in carbs and should be avoided as much as possible. You can eat low carb, high fat nuts such as macadamia nuts, brazil nuts and pecans, and high fat, moderate carb nuts like almonds, walnuts and peanuts. Sugar. Sugar is to be avoided on the keto diet, especially processed sugar. From soft drinks and fruit juice to donuts, cookies, cakes and breakfast cereals, you’re going to need to cut sugar out of your life. You’d be surprised how much sugar is hiding in everyday foods. Make sure to check labels for salad dressings, condiments, sauces and packaged goods. Starches. Starches such as pasta, rice, bread, potatoes, French fries, chips, porridge and so on, should also be avoided on keto. You also need to cut down your consumption of legumes like beans and lentils since they’re super high in carbs. Fruit and Vegetables. As mentioned above, some fruits and vegetables are high in sugar and carbs and need to be cut out. You can eat them once in a while, but limit your consumption as much as possible. Avoid fruits like bananas, kiwis, granny smith apples, and citrus fruits, and high calorie veggies such as mushrooms, squash and parsnip. Following the keto diet plan doesn’t mean you have to swear off desserts! You can satisfy your sweet tooth without consuming sugar with keto sweets you’ll love to indulge in. You can use sugar substitutes like stevia, erythritol and monk fruit sweetener, which are zero calorie sweeteners, and low carb sweeteners like xylitol and tagatose. These sugar substitutes won’t convert to glucose or interrupt ketosis. There are tons of keto dessert recipes you can make at home that aren’t carb or sugar heavy. We’ve rounded up some easy-to-make options you can enjoy on the daily, as well as some more complex ideas you can try on special occasions below. And if you’re looking for keto diet cookbooks to add to your library, the Keto in Five bundle has 120 delicious recipes – 30 each for breakfast, lunch, dinner, and dessert – with up to 5 net carbs per meal. Oh! And each recipe consists of only 5 ingredients and 5 easy steps. Talk about simple! You can totally enjoy life (and satisfy your sweet tooth on the keto diet!). Use these easy, low carb dessert recipes to indulge when you need to! 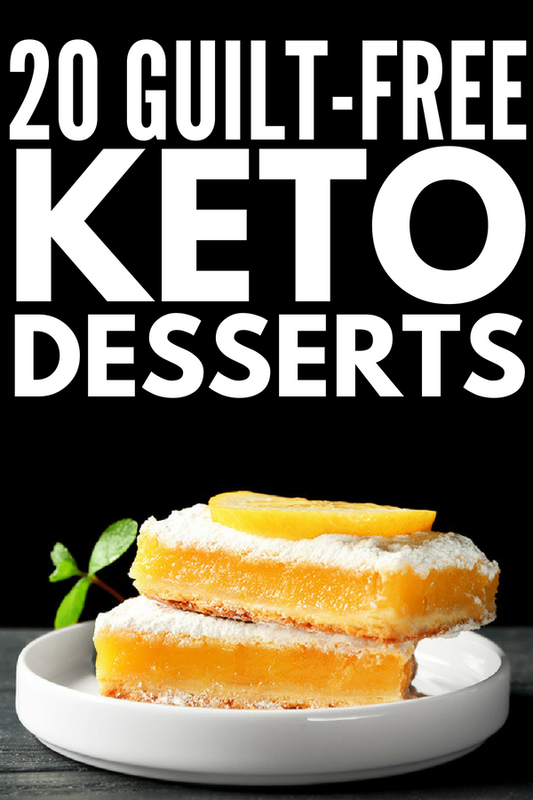 If you loved this post on drool worthy keto desserts, please share it on Pinterest! And if you want more kept recipes, please follow our Health board on Pinterest!